14 Thoughts on Finding the Perfect Bug Out Location. While I am not a fan of bugging out, I realize that situations can force any of us to leave our homes. 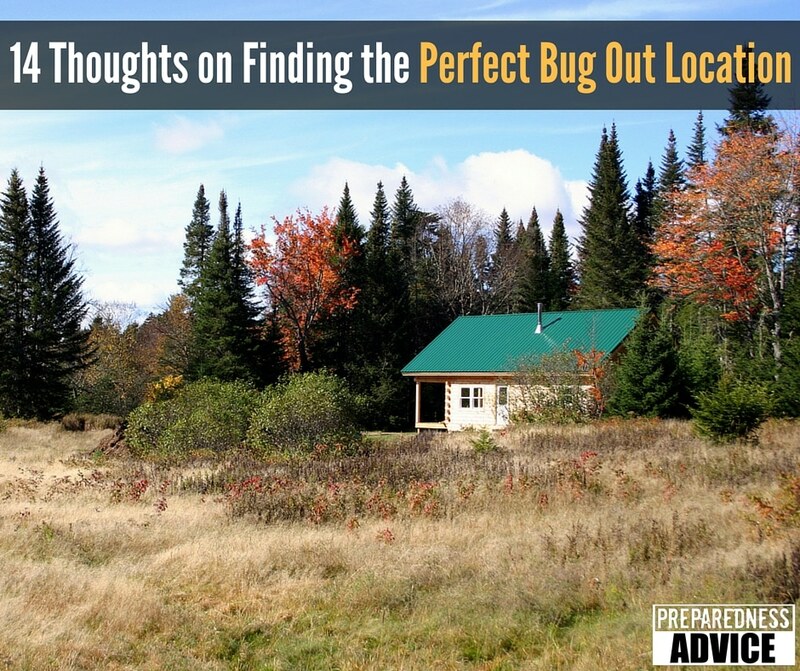 Of course the perfect bug out location is to have a fully equipped home in a good area of the country. That’s just common sense, but most of us can’t afford that, so what are our options? You can find friends or relations that you can join in an emergency. If you make prior arrangements with them and stock some supplies, you will probably be welcome. Don’t just make the mistake of showing up and expecting that they will take care of you. In fact, here’s some wise advice from rural preppers who are pretty sure friends and family will find their way to their homestead. Some people have purchased or gained access to vacant land and stashed supplies ahead of time. This can be a good idea, but you need to have a substantial amount of food and items to provide shelter. You have to hide these supplies well. Some people plan to take supplies with them and live off the land. Unless you are very experienced this is a very hard way to go, avoid this if you can. I know some people who have a second home or small cabin that they keep stocked and ready to move in. This is a great idea if you can afford it and keep it secure. Make sure that you have the ability to get there in an emergency. Some people have already bugged out and now live in theirs year round. Let’s assume you have the money and means to develop a bug out location or resettle to a new area. What criteria would you use to find the perfect retreat location? I would want to be on the edge of a small town, one just large enough to have at least a small hospital and doctors. Maybe 2000-5000 people. No larger. I would want to be at least a hundred miles from a large metropolitan area. I know many people think this is still to close. But with traffic jams, accidents, and fuel problems I don’t think many people would make it this far. The town would not be on any major transportation routes. No main highways, freeways, railroads or large airports. Most people will stick to the major roads. The town would not be located near any military bases, communication centers or critical infrastructure. No large industrial plants, mines or other strategic businesses. Good availability of surface water. An area that exports food and produces more than it uses. I would want to be in a politically conservative area with good firearm laws. As long as there was good water, a decent growing season, and access to heating fuel, I wouldn’t worry about the weather. Avoid any place that the government would be in a hurry to control. For example, major communication links or sources of electric power. I would want at least an acre of good land. Take into consideration the dangers of wildfire. Be sure that local zoning laws will let you accomplish the things you want to without a fight. A very detailed map, like a DeLorme atlas, will provide much of this information for you. Before I moved there, I would spend a fair amount of time learning about the community. In addition to the research you can do through the internet and Chamber of Commerce, you need to spent time there. This means getting to know people other than realtors. Maybe subscribe to the local paper for several months. Go on some of the prepper blogs and ask if anyone lives near there, you may get lucky. Find a church in the area, talk to people. The more you can learn upfront the less you are likely to be disappointed later. A Review of the Book "Build the Perfect Bug Out Bag"
So You Have to Bugout, How Do you Load Out? This entry was posted in bugging out and tagged bug out location, homestead, land, rural. Bookmark the permalink. My wife and I are planning to move from our current middling good location to a more ideal one. Your criteria are very well considered. Excellent post, thank you! Wouldn’t number eight fall under number five and/or at the least number 11? All very good points but really who today, average working person, can afford this extra bug out location? Bug in bug out, where to put our resources. If you stay home you stand a chance to loose it all. If you bug out you stand a chance to loose it either on the road to your private location or when you get there someone else has taken it. Do you get this location as a family or do you get other families to join you? If two or three families go together to purchase the location, whose name goes on the deed? Who decides to kick a family out if they don’t do their part but did pay for their share of the land? do all share in buying the food or does each family buy their own? Who makes sure that each family has purchased the supplies they will need? Who decides what duties each will do? Just a few questions to go with bugging out. It will take more than we realize to get and keep it if things really go bad.I for one hope it won’t. More than likely a wasted hope. But hope is free for now. I know we have to plan and prepare. Good luck to all. As far as number 8 being a problem. Many large areas of the US including most of the Midwest and many farming areas of the west would meet this criteria. Many rural areas produce more food than their population requires. All it takes to meet this requirement is a lot of food producing land and a small population. I wasn’t saying it was a problem. I was asking if it would fall under the other points you made. I do realize that a large portion of the US is farm land and this would be one of the places to be. Some of my ideals come from what I have read or in some of the movies I have seen. Like you I don’t have all the answers but I do ask questions. I try to research as best as I can. I know you do the same from what I have read on your posts. Sorry if I sounded like I was upset. I am like you just looking for answers. Guess I don’t want you coming with me then…..
Wonder, good points there and all things that should be considered when prepping with or without a group. There is a good book, “Patriots” by James Wesley Rawles. Yes, it’s a fiction novel, but it may help put a lot of what you mention in perspective. I found it a good read. Good article. My wife and I just “bugged out” last year. It was more a down sizing and move to the country life than specifically bugging out but that was a part of it too. I was pleased to see we met 12 of 14 of the above mentioned criteria. We are ten miles outside of a town about 16,000 and about 25 miles from a military base for our two misses. One word of caution. When we think of rural areas, we tend to think of idillic small towns and hard working farmers. But many rural areas are very poor and have a large part of the population dependent on the government. They will be in a world of hurt if things go south and could become a problem to you. So do your research well and consult demographic information. Make friends with some of the locals you are comfortable with. They are a wealth of information. The problem I have with this is that you really can’t have an endless supply of stored food and supplies. You have to ask yourself why you would bug out and for how long? Would you be willing to leave your job and loose your income because it probably won’t be there when/if you decide to come back. So that being said you’ll need to have a way to make money or barter for items and food. Bugging out to 1 acre of land you have waiting for you when SHTF is only going to work for as long as your food stores do or someone takes them from you. Loners out in the woods are going to be easy targets to others more desperate. This is why communities are better and you really should get to know your neighbors. Friends stick together better than just “that family that lives down the road”. You will also need the knowledge to forage for local edibles and supplies to grow your own food. You’ll probably want/need the proteins and fats. Wild game will be an option for awhile so know how to locate, trap and hunt, but it could get scarce once people are really starving. Chickens don’t grow from seeds you have in your stores and the mark up and availability on chicks will be difficult if you don’t already have a source you can count on. Plus eggs make great bartering items. Learning a skill or two that is valuable and could produce an income of sorts really is what is going to keep you alive for the long haul. Humans have functioned around societies for ages so find a good one and make your place in it. Late to reading this, but solid advice! Thank you! We “bugged out” last year and are loving it! Outside of a town of 2,000 with a small hospital, lots of farming and lots of Christians. Our place is about 7 miles from town and sits on 5+ acres with a lake. We have put in a greenhouse, large shed, large henhouse and orchard with fruit and nut trees. We are working on plans for a root cellar. We are just short of 100 miles out of all metro cities by 3 miles, so I checked that one as yes. ; ). No military bases or anything else. Feeling really BLESSED! Sent you an email Melissa. I tend to think long term. An acre won’t support very many people for very long. And bugging out after IT hits, you won’t have the knowledge and tools to become self sufficient. It’s better to get to your location and start building. Start planting trees, building up your soil, building fences and buying livestock and growing the food to feed the livestock. It takes a lot of time and money to build up a self sufficient farm. And developing the physical strength to run a self sufficient farm is no laughing matter, to say nothing of the knowledge it takes.